The United States and India wrapped up their first-ever Strategic and Commercial Dialogue. The “strategic” component of the dialogue was outweighed by the “commercial” side. Though both sides gave lip service to important strategic issues relevant to the U.S.-India bilateral relationship, including regional stability, terrorism, nonproliferation, Afghanistan, and the recent deal over Iran’s nuclear program, there was little new. Both sides addressed the issue of terrorism with a specific joint statement, which, among other things, called on Pakistan to bring the perpetrators of the 2008 Mumbai terror attacks to justice. What’s notable in the broader statement, however, is that the U.S. thanked India for its “leadership in evacuating foreign nationals, including U.S. citizens, from conflict in Yemen” (you can read about India’s involvement in Yemen in my earlier report for The Diplomat here). Additionally, both sides highlighted an upcoming India-U.S.-Japan trilateral meeting on the sidelines of the 70th UN General Assembly (Japan is also set to return to the Malabar joint naval exercise this year). The statement also notes the United States’ support for India’s UN Security Council bid as a permanent member, which remains unchanged since 2010. On defense, the joint statement noted that both sides “expressed satisfaction” with progress on the Defense Technology and Trade Initiative pathfinder projects, including the ongoing feasibility studies for bilateral cooperation on aircraft carrier and jet engine technology. Overall, the dialogue included few details on defense issues, which will be more fully fleshed out during the next meeting of the leaders or top defense officials. U.S. Secretary of Defense Ashton Carter visited India in late May, where he and his Indian counterpart, Manohar Parrikar, signed a 10 year defense framework agreement, updating the 2005 document. Most notably, in the joint statement the two sides agreed to jointly train troops in six African countries for UN peacekeeping missions. As the Strategic and Commercial Dialogue concluded, the Indian cabinet announced that New Delhi had approved a $2.5 billion deal to purchased 37 military helicopters from Boeing. Parallel to the strategic and commercial dialogue, high-level representatives from both sides discussed issues related to climate change and energy—a priority for both sides in the lead up to the COP21 talks later this year in Paris. During the Strategic and Commercial Dialogue, U.S. Secretary of Energy Ernest Moniz and Indian Minister of State for Power, Coal, and New & Renewable Energy Piyush Goyal convened the U.S.-India energy dialogue, picking up on a range of initiatives that had been launched during Modi’s September 2014 trip to the United States. Additionally, high-level representatives also convened a U.S.-India joint working group on climate change. Both sides came to several agreements on clean energy and enhancing climate change cooperation. This year’s strategic and commercial dialogue falls into a long series of high-level bilateral encounters, including Modi’s U.S. trip, Obama’s India trip, and Carter’s India visit. between the U.S. and India over the past 16 months. The vast range of topics discussed during this dialogue emphasizes the extent to which the U.S.-India relationship has really seen a profusion in both its breadth and depth in recent years. To book-end a year of breakneck bilateral positivity, Modi is set to meet Obama on the sidelines of the United Nations General Assembly in New York next week. The full 2015 U.S.-India strategic and commercial dialogue joint statement is available here. 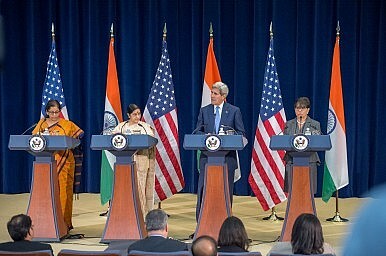 India and the United States took a major leap with the successful conclusion of the first-ever 2+2 dialogue.